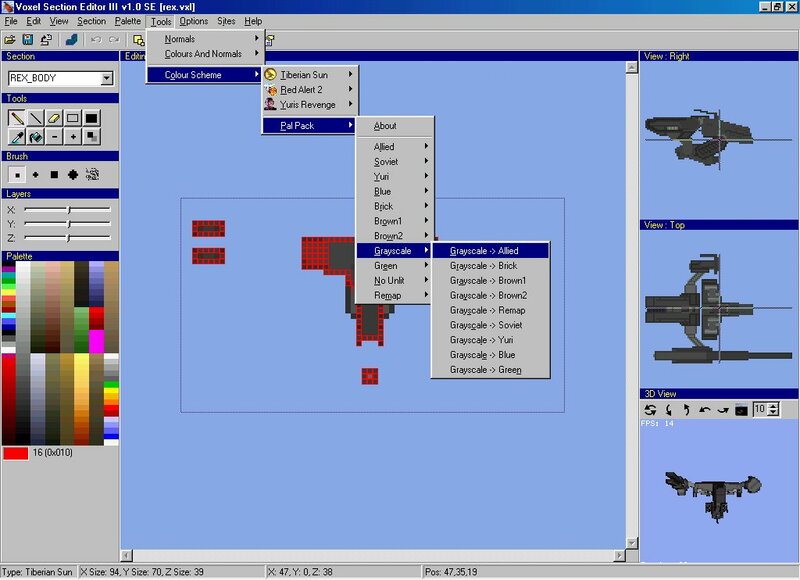 The Open Source Palette Editor is a tool that create palettes and cscheme files. You gonna need that to create .cscheme files or WordPad. 2. .Cschemes Game Types and compatibility. 3. Editing it with wordpad. 4. Using it inside the program. Custom Schemes are files used for instantaneous colour replacement purpouses. 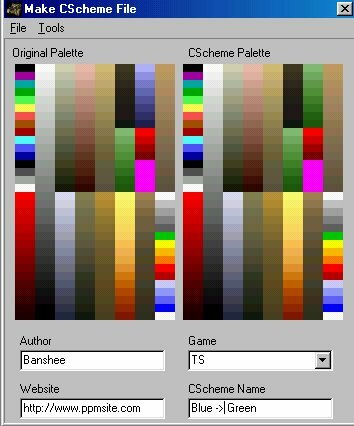 They are in files with the extension .cschemes and they contain the name (that appears in the program), creator, site and informations on which colours will be replaced and which colours will replace them. 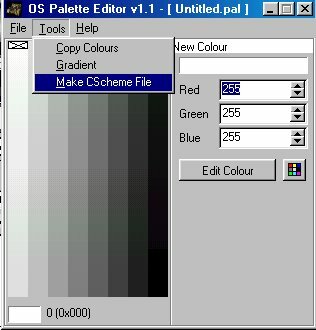 You can create them with OS Palette Editor (look the picture below), by going to Tools -> Make CScheme File. Then, you will see an open box. Select a palette (on the C&C format). We recommend you to search it at the SHP Builder directory or VXLSE III (note: VXLSE II palettes are incompatible). If you dont have any of those programs, extract the palette with XCC Mixer. 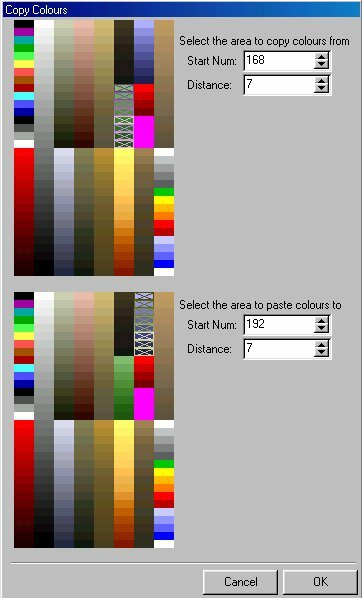 The program also accepts JASC palettes (so in case you have Pal Pack I or II, you can use it). Once you open the palette, you will have the Palette and how does your cscheme looks like. To customize your custom scheme go to Tools -> Copy Colours. There you choose the colours to be copied and where they are placed. The left numbers MUST BE IN ORDER, otherwise there is a risk of the programs mess up stuff. In the beta of VXLSE III, you can find it under Tools -> Colour Scheme. In the VXLSE II 2.x, you can find it under Scripts -> Colour Scheme. VXLSE III 1.1a didn't load custom schemes of the category custom (0). But it did read yellow and red, unlike what I expected. VXLSE III 1.2 does read schemes classified as Custom in the 'Others' category. It will come with the lighting colour killer scheme and few other goodies. So, I'm updating this tutorial. 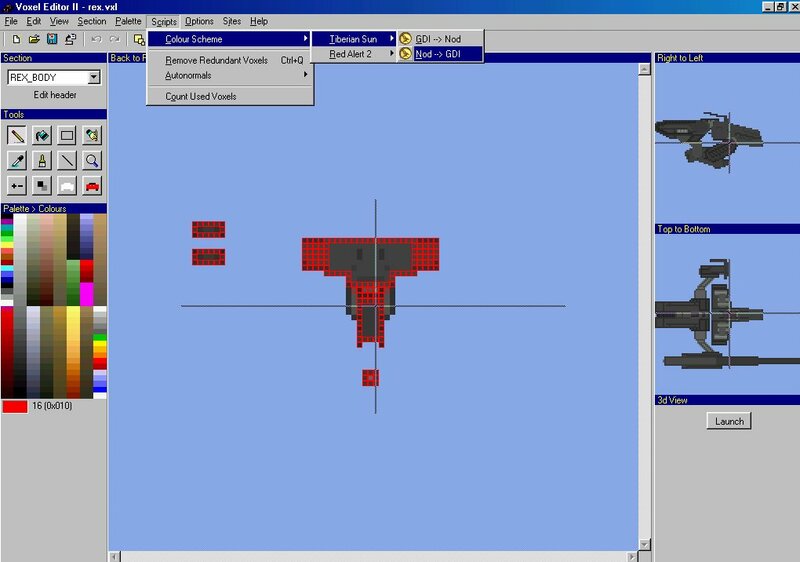 Also, remember to use OS Palette Editor 1.21 to edit the palettes. The tool used in the tutorial above is outdated. Wrong forum. Use the editing forum of the game you are talking about for this kind of question. First step is: read the forum name and description. Forum description: Here's where we post tutorials about how to use its features. Feel free to comment them (even if you are not registered) and spy it to learn more about this program. Certainly, by reading it, you may noticed that you are barely able to ask questions in this section. Forum Description: Improve your ra2/yr modding skills and help other future great modders. So, as you can see, that place is where you can ask and get help about RA2 editing stuff. Since putting voxels in game is RA2 editing subject, you can ask it over there. But, it requires you to be registered. Let's be honest here: it takes few seconds to register. So, register and you'll get help over there. It's a simple matter of reading and understanding. If you don't read what is in front of you, you'll not get success on any computer related activity. By the way, you may like this link. I've used a random voxel. I wasn't the one who did it. It looks like the metal gear rex voxel that was made for the voxel comp. You can get it from yrarg. This dont work, i must to manyual coding in wordpad.. It works if you do it correctly. This was tested before the tutorial was written. The game does not accept .cschemes and it wouldn't make any sense to accept it. This kind of file is exclusive for Voxel Section Editor III and OS SHP Builder.